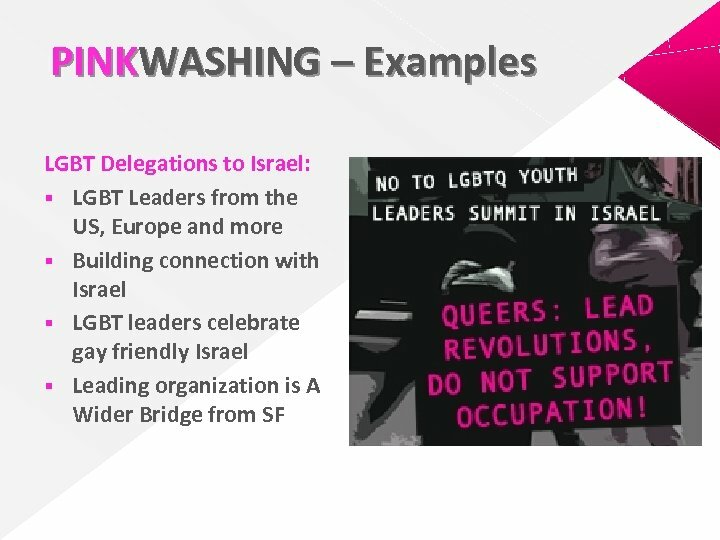 PINKWASHING is a public relation campaign, launched in 2005, in order to divert the international attention away from Israel’s occupation and war crimes by the cynical use of its relative good gay rights. 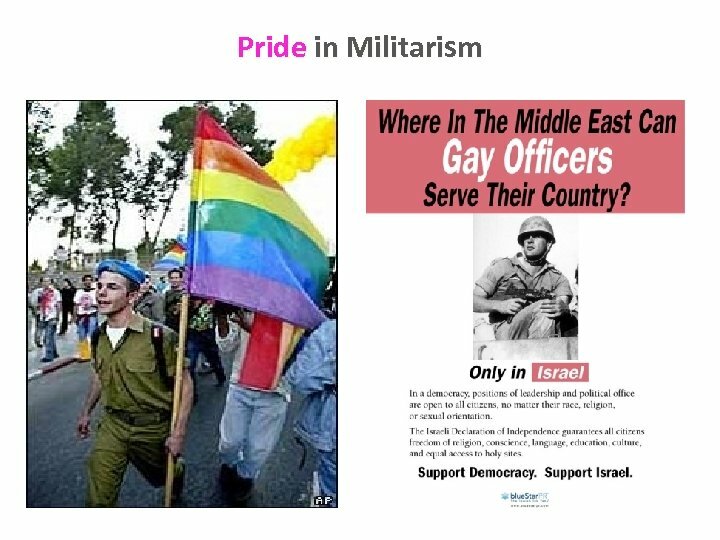 is the attempt to justify Israel’s occupation of Palestine by portraying it as a progressive, democratic and the “only gay haven, ” in direct contrast with the “dangerous” Palestinian society. 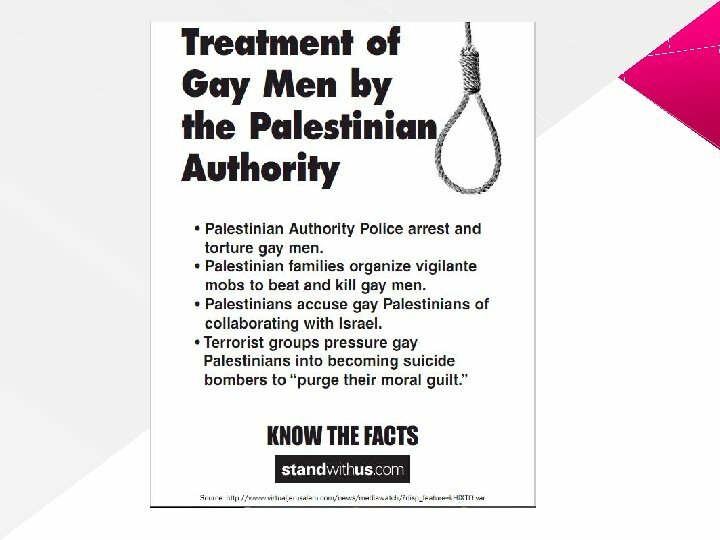 is a campaign led and funded by the Israeli government, in cooperation with LGBT Israeli groups, and Jewish and right wing organizations in North America and globally. 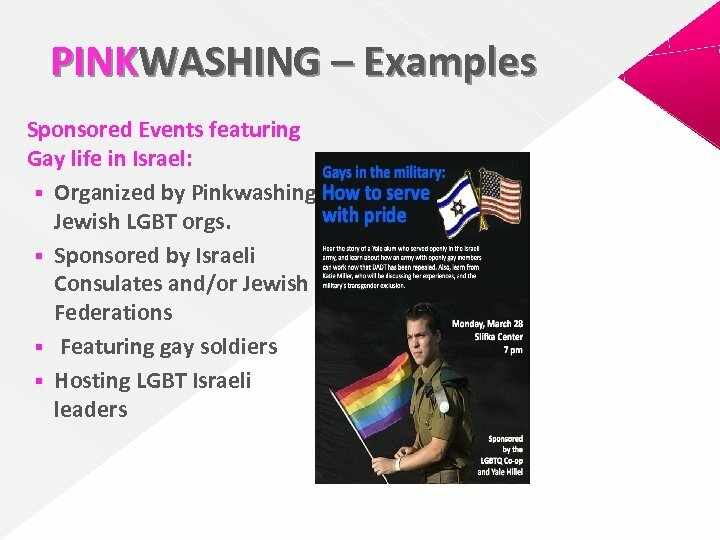 BRAND ISRAEL Pinkwashing is part of Israel’s broader PR government campaign Brand Israel (2005) aimed at fixing the world’s image of Israel as a brutal occupying force and a war zone, and re-branding Israel as a “modern democracy in the Middle East. 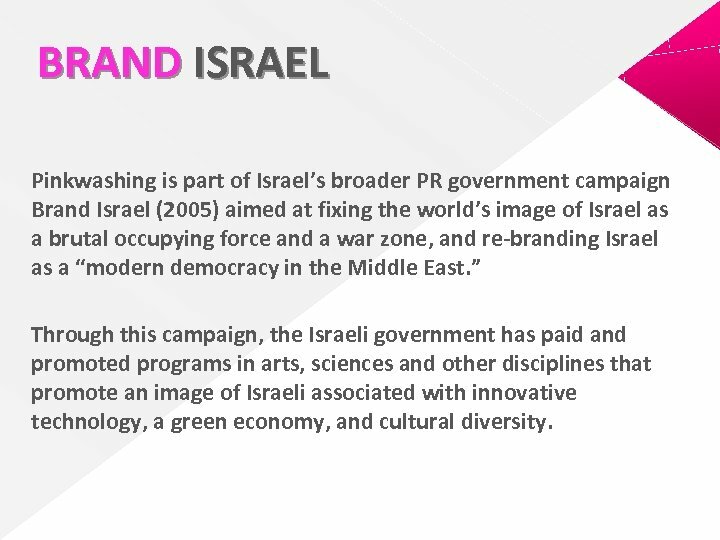 ” Through this campaign, the Israeli government has paid and promoted programs in arts, sciences and other disciplines that promote an image of Israeli associated with innovative technology, a green economy, and cultural diversity. 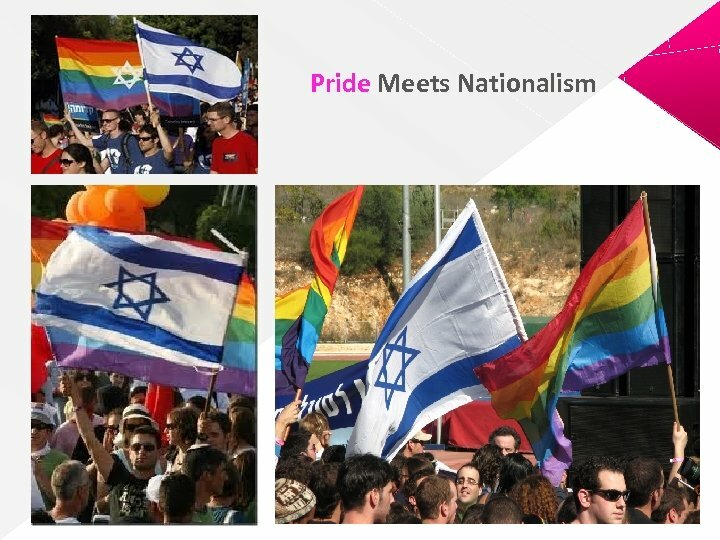 PINKWASHING LOGIC Racist -Colonial Logic § using “Israel’s gay rights” record aims to normalizes Zionism - a racist ethnic ideology – and make it more appealing to gay people globally. § does not simply emphasize how Israel is a fun, fabulous, modern - thus democratic and liberal - state, but it is mainly based on dehumanizing Palestinians by presenting them as backward. § homophobia and intolerance is a rooted disease in Palestine while tolerance is inherent to Israel as a liberal modern project. § the relationship between Israel and Palestine is between those who are "modern/open", and those who are "backward/homophobic“ and NOT colonizer-colonized. 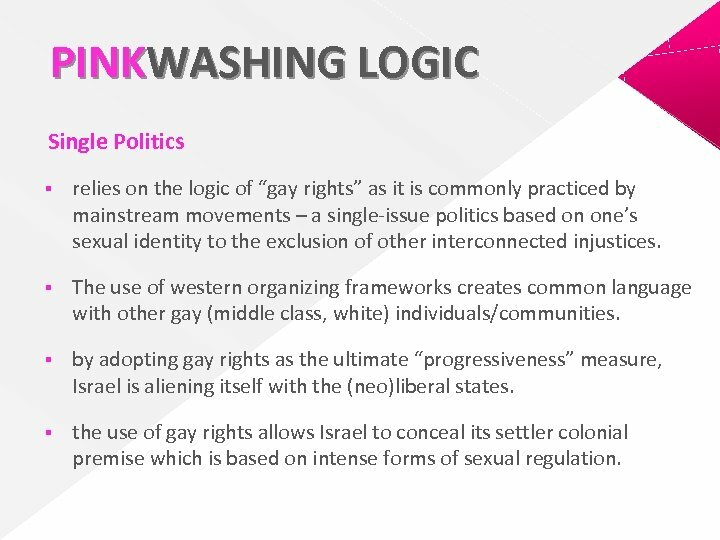 PINKWASHING LOGIC Single Politics § relies on the logic of “gay rights” as it is commonly practiced by mainstream movements – a single-issue politics based on one’s sexual identity to the exclusion of other interconnected injustices. § The use of western organizing frameworks creates common language with other gay (middle class, white) individuals/communities. § by adopting gay rights as the ultimate “progressiveness” measure, Israel is aliening itself with the (neo)liberal states. § the use of gay rights allows Israel to conceal its settler colonial premise which is based on intense forms of sexual regulation. 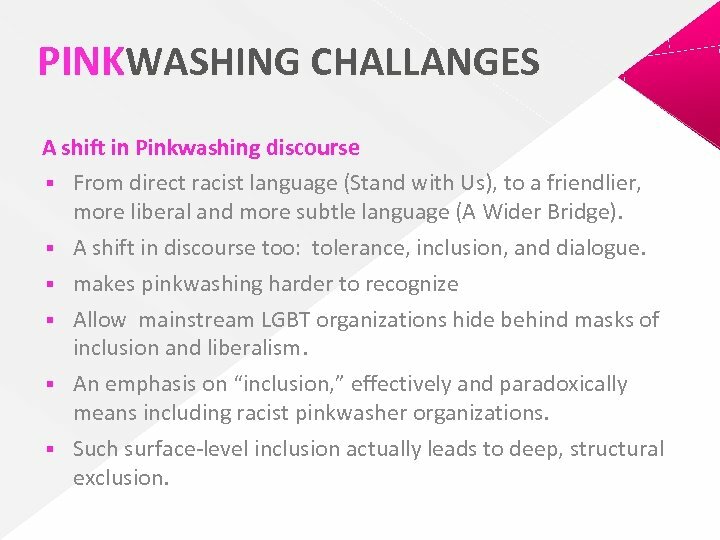 PINKWASHING CHALLANGES A shift in Pinkwashing discourse § From direct racist language (Stand with Us), to a friendlier, more liberal and more subtle language (A Wider Bridge). § A shift in discourse too: tolerance, inclusion, and dialogue. § makes pinkwashing harder to recognize § Allow mainstream LGBT organizations hide behind masks of inclusion and liberalism. 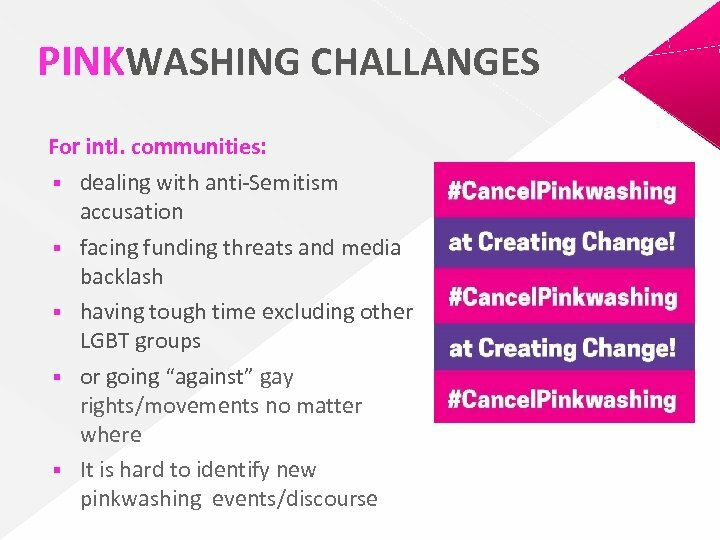 § An emphasis on “inclusion, ” effectively and paradoxically means including racist pinkwasher organizations. § Such surface-level inclusion actually leads to deep, structural exclusion.